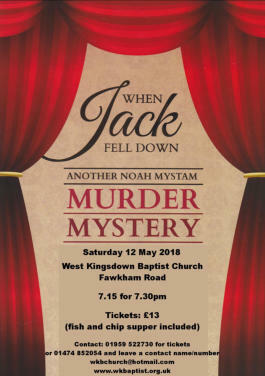 When Jack Fell Down,,, The seventh in the series of the Noah Mystam murder mysteries - written and performed for the Hospices of Hope and other charity functions. A performance of a murder mystery play is disrupted by the death of one of the cast, falling from the theatre balcony. Noah Mystam is intrigued. Is real life copying the play? And why do nursery rhymes suddenly seem so important? Hawl’s Well That Ends in Murder When Jeremiah Hawl decides to set up a business selling the local spring water, his well excavations uncover a body. When another body turns up in the same ‘grave’, Noah Mystam is called to investigate. Who has been murdered? Are the two deaths connected? And what does a local tramp have to do with it? The Grave Peril of the Pilkington Garden Gnomes A garden gnome goes missing, someone gets murdered on the Pilkington Estate and another gnome goes missing. Who is nicking gnomes? Who wants to rid the village of Borage-by-water of one of its residents and why? An Horrendously Horrible Happening in Austria A tour party from the village of Little Quavering arrives in the Austrian town of Grufstein, where one of the group, a music student falls from the battlements of the local castle into the river and drowns. Did she jump or was she pushed? Well, she was pushed, of course. But who did it? The Strange Delving of Shrapnel’s Ditch A jockey goes missing after apparently throwing a race. When one of his cufflinks turns up in Noah Mystam’s post, the detective heads for the village of Bland’s Patch where further investigation reveals that the jockey was murdered. Is love of money the root of the evil or is it the work of a rejected lover or is there a darker secret at work? The Tantalising Case of Dracula’s Tooth When Noah Mystam receives an invitation from a crime writer to a party at Dracula’s castle in Transylvania, he might have expected foul play. He discovers that the world of publishing is rife with jealousies and acrimony. The question is which of the assembled authors, illustrators and publishers has the bitterest enemy? The Dazzling Case of the Missing Elephant of Mumbai A crime committed in India brings Noah Mystam to Uganda. A murder has taken place in a safari guest house. But who is the murderer and why is an Indian elephant involved?